Janell from Isabella and Max made these simply lovely dining slips from, none other, than drop cloth! 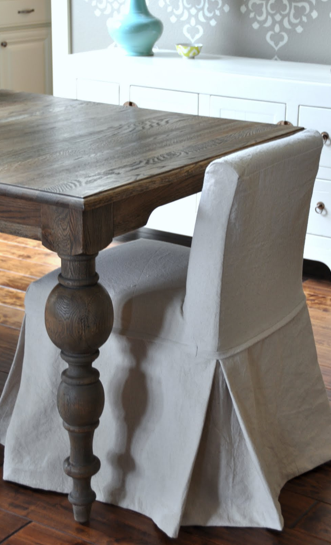 We love drop cloth, don’t we?! 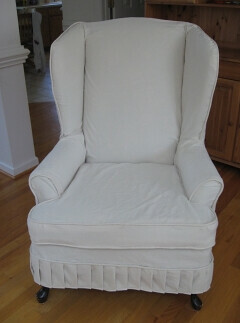 A simple modern white slipcover for this wing chair from Apartment Design. 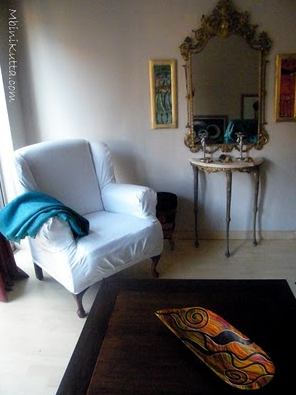 Another gorgeous wing chair I found via squidoo. The title is “Are you a slipcover virgin?” Love it! Pleats…swoon! If you have a slipcover you’re working on, let me know! I’d love to feature you and your slip! I saw that drop cloth chair yesterday on her blog! She did a great job. I asked you a question on your fb page yesterday about fabric. Did you happen to see it? I just started blogging; my 2nd post was the slipcover I made for my resin/plastic chair. I'm trying to become a sewer and I love your blog. I'd love for you to check out my slipcover! ooooo love the wingback! So, when are you going to come see the finished cottage?